For years, election security experts have assured us that, if properly implemented, paper ballots and routine manual audits can catch electronic vote tally manipulation. Unfortunately, there is no universal definition of “paper ballot,” which has enabled vendors and their surrogates to characterize machine-marked paper printouts from hackable ballot marking devices (BMDs) as “paper ballots.” Unlike hand-marked paper ballots, voters must print and inspect these machine-marked “paper ballots” to try to detect any fraudulent or erroneous votes that might have been marked by the BMD. The machine-marked ballot is then counted on a separate scanner. Most independent cybersecurity election experts caution against putting these insecure BMDs between voters and their ballots and instead recommend hand-marked paper ballots as a primary voting system (reserving BMDs only for those who are unable to hand mark their ballots). But vendors and many election officials haven’t listened and are now pushing even more controversial “hybrid” systems that combine both a BMD and a scanner into a single unit. These too are now sold for use as a primary voting system. Unlike hand-marked paper ballots counted on scanners and regular non-hybrid BMDs, these new hybrid systems can add fake votes to the machine-marked “paper ballot” after it’s been cast, experts warn. Any manual audit based on such fraudulent “paper ballots” would falsely approve an illegitimate electronic outcome. According to experts, the hybrid voting systems with this alarming capability include the ExpressVote hybrid by Election Systems & Software, LLC (ES&S), the ExpressVote XL hybrid by ES&S, and the Image Cast Evolution hybrid by Dominion Voting. Full Article: New 'Hybrid' Voting System Can Change Paper Ballot After It’s Been Cast - WhoWhatWhy. This article was originally posted at Freedom to Tinker on October 16, 2018. 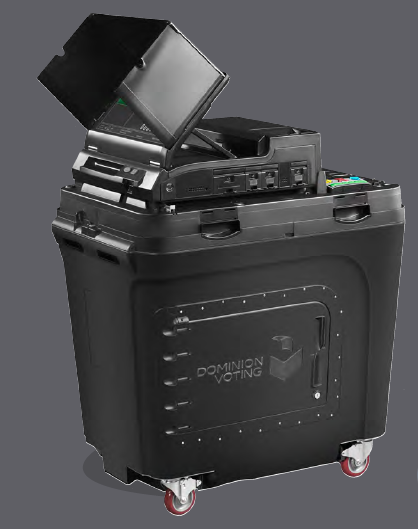 The Dominion ImageCast Evolution looks like a pretty good voting machine, but it has a serious design flaw: after you mark your ballot, after you review your ballot, the voting machine can print more votes on it!. Fortunately, this design flaw has been patented by a rival company, ES&S, which sued to prevent Dominion from selling this bad design. Unfortunately, that means ES&S can still sell machines (such as their ExpressVote all-in-one) incorporating this design mistake. Some voters are unable to mark their ballots by hand–they may have a visual impairment (they can’t see the ballot) or a motor disability (they can’t physically handle the paper). Ballot-marking devices (BMDs) are provided for those voters (and for any other voters that wish to use them); the BMDs are equipped with touchscreens, and also with audio and tactile interfaces (headphones and distinctively shaped buttons) for blind voters, and even sip-and-puff input devices for motor-impaired voters. These BMDs print out a paper ballot that can be scanned by the optical scanners and can be recounted by hand. Full Article: Design flaw in Dominion ImageCast Evolution voting machine. Clark County Registrar of Voters Joe Gloria said Wednesday that a combination of human error and technical problems allowed up to 43 voters to cast ballots twice in the primary election. During a County Commission meeting to certify election results, Gloria said he is unsure why some voters believed their first attempt to vote was unsuccessful. But he explained that volunteer poll workers during early voting and on Election Day did not confirm whether those voters’ ballots had been properly submitted before they were allowed to re-vote. “Had that been done, we probably would have avoided this whole situation,” he said, adding that it is his department’s responsibility to properly train poll workers. Full Article: Human error, tech problems cause of double voting in primary election – Las Vegas Review-Journal. Nearly a week after Nevada’s primary election, officials are yet to look under the hood to see what caused glitches with Washoe County’s new voting machines. County Registrar of Voters Deanna Spikula said her office was still working to finalize and audit results from last week’s primary election and had not had a chance to conduct a full assessment of what went wrong with the county’s recently unveiled, multimillion-dollar election hardware. Officials last week said they were aware of fewer than 10 voters affected by well-publicized malfunctions that left some candidates off of ballots or displayed the wrong slate of ballot choices — potentially giving voters a chance to help decide races they weren’t eligible to vote in. Full Article: Election Day: Officials still probing glitches with voting machines. Washoe County is looking into multiple reports of candidates being left off primary election ballots, officials confirmed Tuesday afternoon. Officials also heard complaints from voters who said Washoe’s new voting machines had offered them a previous voter’s candidate choices, potentially giving them a chance to cast a ballot in races they aren’t eligible to vote in. County Registrar of Voters Deanna Spikula said fewer than 10 voters had been affected by the glitches. “At this time none of these issues will affect tabulation and again, all voters have successfully cast their ballots at the polls,” Spikula said at a Tuesday afternoon press conference. Full Article: Nevada primary: Ballot problems reported in Washoe County. Officials reported “isolated” primary voting glitches Tuesday involving the state’s new touch-screen voting machines in Nevada’s two most populous areas, and blamed the system for a technical problem that delayed the count of ballots in one rural northern county. Registrars in Las Vegas and Reno said a small number of voting machines failed to properly display all candidates’ names early in the day, and a state official and a member of The Associated Press election tabulation team said the vote tally was delayed for more than two hours after polls closed in Pershing County. In no case were voters unable to successfully cast a ballot with help from poll workers, said Jennifer Russell, spokeswoman for the Nevada Secretary of State’s office. Full Article: 'Isolated' vote glitches solved with Nevada voting machines | Myrtle Beach Sun News. Using state-of-the-art voting machines wouldn’t have changed the controversial results of Michigan’s presidential election last fall, according to Detroit and state election officials. But new digital machines unveiled Saturday — to about 1,200 volunteer supervisors of Detroit’s polling sites — won’t suffer the frequent breakdowns of the old machines, causing lines to back up with impatient voters, and soon will be used statewide, officials said. “At the end of the day, we all have one goal, right? To ensure that every person that wants to vote gets to vote and we count that vote accurately,” Detroit City Clerk Janice Winfrey told the poll workers. In an event billed as an equipment fair, Winfrey and her staff showed off the new, $4,000 voting tabulators to noisy, curious crowds of election volunteers who gathered — one group in the morning, another in the afternoon — at Wayne County Community College in downtown Detroit. Full Article: Detroit getting new voting machines, bound statewide. A proposed half-million-dollar-plus purchase of new voting equipment by the Reno County Clerk’s Office will move the county back to all paper ballots. The Reno County Commission will vote today on awarding the purchase contract, and County Clerk Donna Patton and Election Officer Jenna Fager are recommending equipment from Michigan-based ElectionSource, despite it being the highest of three bids. They anticipate savings in printing costs will more than offset the $13,000 in additional costs, Patton advised the commission last week. Overall, the contract – including discounts for trade-in, a multi-county group discount and signing a contract before the end of the year – is for $538,830. Reoccurring annual fees, after the first year, for software and firmware licenses and annual maintenance, total some $60,265. Full Article: Reno commission to consider $538,000-plus voting machine purchase | Local/State News | hutchnews.com. State election officials said Pueblo County would have had to test the county’s election system with 50,000-60,000 test ballots to discover the limited data base on the Dominion Express system that filled up on Election Day, causing days of delay in getting final results. Dwight Shellman, county support manager for the Colorado Secretary of State’s Office, said the limited data base was not mentioned in any of the vendor’s documentation about the Microsoft SQL Express system and that neither state or county officials were aware of it — until the computer server stopped working on Election Day. “We approved that purchase, but if we’d known its limitations, we wouldn’t have,” Shellman said Tuesday. Both Secretary of State Wayne Williams and County Clerk Gilbert “Bo” Ortiz have explained how the vendor — Dominion Voting Systems — rushed a much bigger server to the county last Tuesday to remedy the logjam in counting more than 80,000 votes. Full Article: Tests didn’t find limits in voting system | The Pueblo Chieftain. Logan County Clerk and Recorder Pam Bacon got some welcome news this week while in Fort Collins for the Colorado County Clerks Association three-day winter conference. Wednesday at the conference, Colorado Secretary of State Wayne Williams announced that he has some funding available to help counties with the purchase of new voting equipment in the next two years. According to a press release from Williams’ office, the state will use $850,000 in federal Help America Vote Act funds to cover 50 percent of a county’s costs to train, test, install and manage the project. The U.S. Election Assistance Commission, which is a unit within the Justice Department and the grantor, approved Williams’ decision. Full Article: Federal funds to help with new voting system costs - Journal Advocate. County clerks and election staffers from across the state are in Fort Collins this week for the Colorado County Clerks Association Winter Conference. Those officials will learn best practices and get updates on new election laws. They can also get demonstration of voting machines in action from multiple vendors. But a proposed rule change by Secretary of State Wayne Williams will soon prevent counties from buying their equipment anyone other than Dominion Voting. “We believe that by working together as a state, we’re able to negotiate a better deal and we’ve actually achieved that, so far,” Williams said. “We’re in the middle of those contract negotiations but I’m optimistic it’s going to be a very good deal for taxpayers across the state.” In addition to the bulk discount, Williams said instituting a Uniform Voting System will make it easier to train election officials. It will also gives voters a more common experience at the polls. “The goal throughout this process has been to ensure the best possible experience for Colorado voters and to ensure the integrity of the process,” Williams said. There’s just one problem: the state isn’t buying the machines. That expense falls to the counties. Full Article: Election equipment debate: bulk discount vs state backed monopol - KOAA.com | Continuous News | Colorado Springs and Pueblo. Hernando County will update their voting system in time for the 2016 Election Cycle. Supervisor of Elections Shirley Anderson announced that she will begin contract negotiations with Dominion Voting Systems, one of the two companies who submitted a bid. “We are very excited to continue our working relationship with Dominion Voting Systems. They have provided a reliable tabulation system and excellent customer service to Hernando County since 1998,”stated Supervisor Anderson. As in previous elections, voters will fill in the ovals on a paper ballot. One of the many new features is that we will only have one universal vote tabulator. The new system will allow disabled voters to cast a paper ballot using the same equipment as all other voters. Full Article: Hernando County Elections Office to Purchase New Voting Equipment for 2016 | Hernando Sun. Full Article: Callaway County Clerk requests new voting machines | Fulton Sun. Incumbent state Land Commissioner Ray Powell asked the state Supreme Court on Monday to temporarily halt an automatic recount of votes in the contested land commissioner race, alleging the state Canvassing Board has violated state law and the election code. The last unofficial election results showed Powell, a Democrat, losing by a 704-vote margin to Republican challenger Aubrey Dunn out of 499,666 votes cast, or about 0.14 percent of the votes. State law calls for an automatic recount when the margin between two statewide candidates is less than half of 1 percent of ballots cast. Dunn maintained a slim lead through post-election canvassing by county clerks and the state Canvassing Board. But Powell alleges there have been several irregularities, including the vote recount order approved by the state Canvassing Board on Nov. 25. Full Article: Powell asks court to block recount - The Santa Fe New Mexican: State. Taos County Clerk Anna Martinez spent nearly 12 hours Tuesday (Nov. 4) driving around from voter precinct to voter precinct troubleshooting issues with the new ballot machines supplied by the state. Due to problems with machines in nearly half of the county’s 36 precincts, staff at the clerk’s office had to hand-tally the ballots from 16 precincts — delaying the election result reports until 1 a.m. Wednesday morning. ”It’s hard to get into a new machine that you don’t know anything about,” Martinez told The Taos News Wednesday. The Taos News received a handful of comments and calls complaining of problems with the machines. Despite the problems, Martínez insisted the vote totals were accurate. Full Article: Glitches plague voting machines, clerk resorts to hand tallies - The Taos News: News. Two ballot-tabulating machines malfunctioned Tuesday during early voting at the Doña Ana County Government Center, ruffling feathers among voters and election officials. However, county election officials assured the problem — which is still under review — won’t harm the integrity of the election. That’s because paper ballots counted by the affected machines can be fed into different, functional machines, they said. Doña Ana County elections supervisor Scott Krahling said election workers at the site noticed Tuesday morning that ballots weren’t being accepted by the machines as readily as in past days of early voting. Voters often would insert a valid ballot, only for the machines to reject it. Full Article: Two ballot machines malfunction at Doña Ana County Government Center - Las Cruces Sun-News. As primary-elections wraps-up and general elections approaches in November, voter technicians are excited about the new technology they have. A new machine called I.C.E. will ultimately change the way voters vote in the future. The past decade technology has taken the world by storm. Here in Tallahassee the supervisor of elections Ion Sancho’s office and staff have worked hard in getting this new technology out to the capital cities voting poles and precincts. William Stewart a voting system tech here at the Leon County branch is hands on with this new technology. Testing and deploying voting equipment, the ImageCast Evolution also known to them as I.C.E. was the main attraction. “Combining two devices in one makes casting audio and visual ballots easier and faster for voters” said Stewart. Full Article: Voting hits the new millennium. New Mexico voters in the Nov. 4 general election will cast ballots using new voting machines, which have cost the state nearly $12 million over the past two years to purchase and set up. Secretary of State Dianna Duran’s chief of staff Ken Ortiz said county clerks in all 33 counties have received thorough training on the machines in recent months. “Our office is confident that there is an adequate plan in place for election night,” Ortiz told the Journal in an email. A Legislative Finance Committee report released earlier this month raised questions about relying on the machines’ Colorado-based vendor for oversight and troubleshooting. Full Article: New voting machines set for Nov. 4 election | Albuquerque Journal News. Santa Fe County voters will cast their ballots on new voting machines during the November general election. Full Article: County invites public to test new voting machines - The Santa Fe New Mexican: Local News.